Justina Chen is an award-winning writer. Her latest book, THE ART OF INSPIRATION: LEAD YOUR BEST STORY, is for any leader who wants to inspire employees, customers, and constituents. Her YA novel, NORTH OF BEAUTIFUL, was named to Best Books lists by Kirkus Reviews and Barnes & Noble. Her other novels include A Blind Spot for Boys, Return to Me, Girl Overboard (a Junior Library Guild premiere selections) and Nothing but the Truth (and a few white lies), which won the Asian Pacific American Award for Literature. 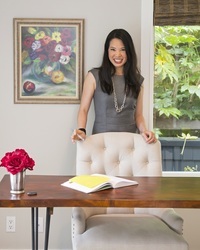 When she isn’t writing for teens, Justina is a st Justina Chen is an award-winning writer. Her latest book, THE ART OF INSPIRATION: LEAD YOUR BEST STORY, is for any leader who wants to inspire employees, customers, and constituents. Her YA novel, NORTH OF BEAUTIFUL, was named to Best Books lists by Kirkus Reviews and Barnes & Noble. Her other novels include A Blind Spot for Boys, Return to Me, Girl Overboard (a Junior Library Guild premiere selections) and Nothing but the Truth (and a few white lies), which won the Asian Pacific American Award for Literature. To ask Justina Chen questions, please sign up. We’d love your help. Let us know what’s wrong with this preview of Hit by Lorie Ann Grover. We’d love your help. Let us know what’s wrong with this preview of Firstborn by Lorie Ann Grover. We’d love your help. Let us know what’s wrong with this preview of Nowhere Girl by A.J. Paquette. We’d love your help. Let us know what’s wrong with this preview of Fair Game by Valerie Plame Wilson. What randomly selected book would you like to read in May?